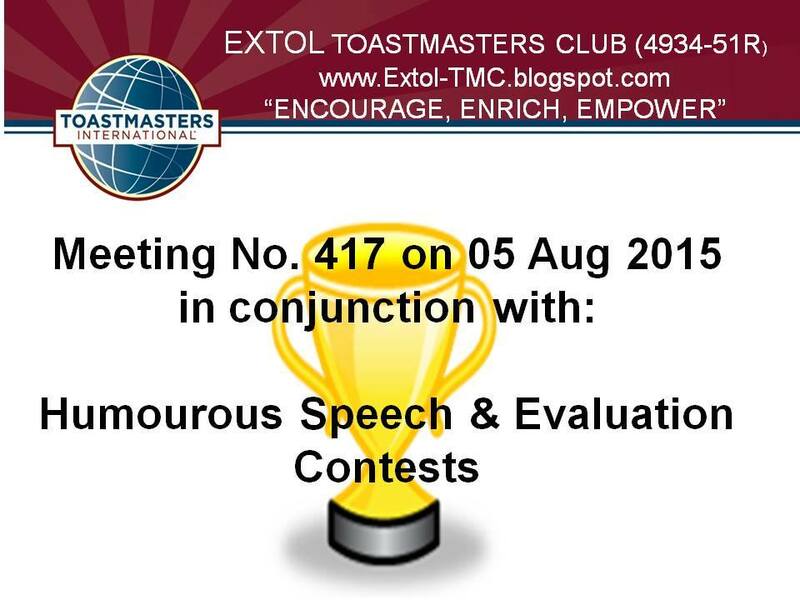 We had a meeting “to enhance” our public speaking and leadership skills and most of all to “exalt” our beloved club. We firstly extended our warmest welcome to Geoff Andrew, DTM from MIM KL Toastmasters Club, and the General Evaluator for this meeting. We also extended our warmest welcome to our guests, Jerrie Yeap and Joevy Tan from Subang Toastmasters Club who were the Table Topics Master and Ah Counter, respectively in our meeting. Thank you, Jerrie and Joevy! ASA, Tham Yen Lai called the meeting to order at 7.20pm. Good work, Yen Lai! President, Ken Koh, ACB, in his opening address remarked how impressed he was with senior members who continued to attend meetings not only “to enhance” their public speaking and leadership skills but to motivate all the club members and to continuously “exalt” our club with zest and zeal. We are impressed too, Ken! TME, Pun Yew Kee, CC, conducted the meeting smoothly and ensured that everybody participated by introducing themselves at the beginning of the meeting. Well done, Yew Kee! Dr Ravi invoked all to be the brave captains of our own ships with a deer and dog story which was both inspiring and uplifting. We shall always be courageous, Ravi! Table Topics Master, Jerrie Yeap carried out a very motivating Table Topics session which drew five voluntary speakers. Kudos, Jerrie! The first topic, “Don’t be afraid to fail, be afraid not to try” was very well attempted by Alan Fung who believed that we must always push ourselves beyond the realm of expectations to overcome our fear and insecurity. 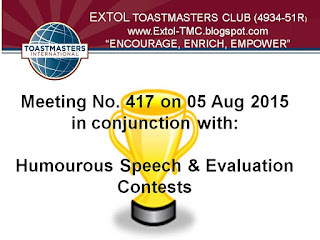 The second topic, “It is easier to give up than to hold on” was agreed by Jeannie, ACS, ALB who informed that despite our activity-filled, demanding and busy life, we need to attend Toastmasters meetings to wind down, relax and recharge ourselves. The third topic, “Obstacles are challenges for winners, but excuses for losers”, was affirmed by Mohmmad Muslim who informed us how he overcame his weakness in his Accounts subject and eventually scored a distinction for it in his MBA programme. The fourth topic, “Life is like riding a bicycle, to keep your balance, you must keep moving” was demonstrated by Ken Koh, ACB on how he continued cycling although he fell down countless times, similarly he kept going despite encountering numerous failures in his life. The fifth topic, “The beginning is always the hardest” was acquiesced by Joanne Kuek who found it difficult to do public speaking initially but once she started she discovered to her delight that she could do it. Thank you all impromptu speakers for your audacity and your enthusiastic speeches! And the best Table Topics Speaker went to Joanne Kuek. Congratulations, Joanne! We were both frightened and tickled by Humour Master, Sam Koh’s story of a lady in an old taxi driven by an old man. You are another great humour master in the making, Sam! All the spontaneous speakers received very encouraging, educational and edifying evaluations from Table Topics Evaluator, SK Ratnam, DTM. Thank you, SK! The first project speaker Muhammad Akmal delivered his Ice Breaker speech entitled, “My journey” narrating his changing ambition from tanker driver, designer, engineer, accountant and how he finally became an engineer. Great speech, Akmal!! His evaluator, Dr Ravi felt and concluded that he was very sincere and that he spoke from his heart. Thank you, Ravi! Second speaker, Joanne Kuek presented her CC # 2 entitled, “Step away from your handphone” with stories about the usefulness, the power, the danger about the all-consuming handphone which was indispensable in our lives. Very enlightening speech, Joanne! Her evaluator, Alan Fung remarked that her speech was well-prepared, well-delivered and organised and all she needed was a dose of confidence. Thank you, Alan! Final speaker, Tham Yen Lai did her CC # 3 entitled, “Stress management” by giving us 7 pointers on how to relax, release and relief ourselves which we desperately needed in this frenzy, hectic, stressful world. Very informative speech, Yen Lai! Her evaluator, PY Wong, ACS felt that her recommendations were truly needed, essential and applicable for everybody to practice and cultivate in today’s trying, intense and demanding lifestyles. Thank you, PY! The Best Speaker was Joanne and the Best Evaluator was Alan Fung! Congratulations, Joanne and Alan!! Ah Counter, Joevy Tan presented a detailed report of pause fillers used by speakers throughout the meeting and our club’s fund was boosted. Thank you, Joevy! Grammarian, Jeannie, ACS, ALB asked everyone to say the Word of The Day unanimously, recalled all the beautiful phrases, and corrected the wrongful usage of words, sentences and pronunciations. That was stupendous, Jeannie! Mohmmad Muslim presented a precise and meticulous timing report of the whole meeting. Splendid job, Muslim! Listening Evaluator, Kwa Ngan Eng, DTM picked ten seemingly difficult questions but Jeannie, ACS, ALB got nine correct answers, and was awarded the Best Listener. Great job, Ngan Eng! Congratulations, Jeannie! General Evaluator, Geoff Andrew, DTM, was pleased with the meeting proceedings, his suggestions were to provide more time in-between speech evaluations and his enquiry on the validity of the word “invocator”. We shall act upon your recommendations. Thank you, Geoff! For his closing address, President Ken Koh, ACB edified the General Evaluator, Geoff Andrew, DTM on his excellent memory and he wished he himself had such a good memory as well. He encouraged our club members to attend an Evaluation Workshop by Fabian Fidelius on 20th September 2015 to be held in Sunway University. He also encouraged all our club members to go and support our double Champion, Alan Fung at the Area C3 Humourous & Evaluation Speech Contests on 27th September 2015 to be held in SJMC. Goodnight. See you at our next meeting on 2nd September 2015! Congratulations, Alan Fung. He will represent our club at Area C3 Humourous & Evaluation Speech Contests on 27 September 2015 at SJMC.